The college’s strategic plan called for a more aggressively broadcast message about its distinctive value to better stand out in a crowded marketplace. By redefining its main entranceway, Siena’s goal was to create a modern solution that would convey important, branded information to the campus and community. The college turned to Saxton Sign Corp. of Castleton, N.Y., to help imagine, design and install a new entranceway sign for the campus. The new sign, a double faced internally illuminated sign box with routed out and pushed through lettering for identification, is mounted above back-to-back 10mm Watchfire digital message boards. The college uses the message centers to post positive information that conveys what makes Siena different from other area colleges, including facts, images, campus achievements and events. The ability to change messages easily has helped the college clean up the clutter from directional and event signage that would spring up along busy U.S. Route 9 where the campus is located. The college also is able to sell advertising space on the sign to promote upcoming events on campus. According to Lisa Tymchyn, account manager at Saxton Sign Corp., the company specified Watchfire message centers because of their reliability, how good the boards look, and the support received from Watchfire. “This was a complicated project that required achieving the right design for a conservative but still modern look, permitting, and overcoming placement obstacles. Our Watchfire rep was a huge help in getting this project over the finish line,” said Tymchyn. 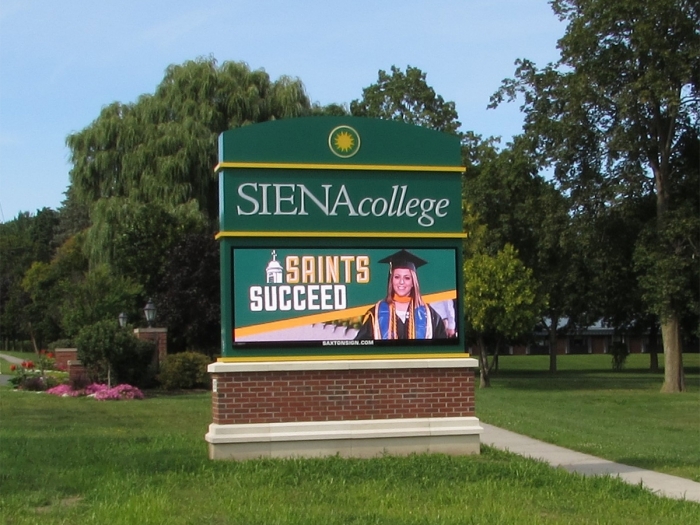 Watchfire worked with Siena College to develop and program content so messages would begin running as soon as the sign was turned on. The feedback from students, alumni and the community has been overwhelmingly positive. In fact, nearly 1,000 alumni voiced their support on social media after the college posted a photo of the new sign.